Johann Karl August Radon (December 16, 1887–May 25, 1956) was an Austrian mathematician. His doctoral dissertation was on calculus of variations (in 1910, at the University of Vienna). Radon was born in Děčín, Bohemia, Austria-Hungary, now Czech Republic. He received his doctoral degree at the University of Vienna in 1910. He spent the winter semester 1910/11 at the University of Göttingen, then he was an assistant at the Deutsche Technische Hochschule Brünn (Brno), and from 1912 to 1919 at the Technical University of Vienna. In 1913/14, he passed his habilitation at the University of Vienna. 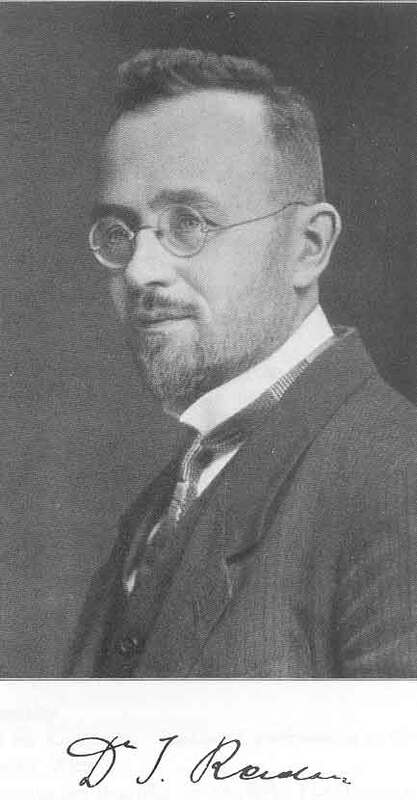 In 1919, he was called to become Professor extraordinarius at the newly founded University of Hamburg; in 1922, he became Professor ordinarius at the University of Greifswald, and in 1925 at the University of Erlangen. Then he was Ordinarius at the University of Breslau from 1928 to 1945. After a short stay at the University of Innsbruck he became Ordinarius at the Institute of Mathematics of the University of Vienna on October 1, 1946. In 1954/55, he was rector of the University of Vienna. In 1939, Radon became corresponding member of the Austrian Academy of Sciences, and in 1947, he became a member. From 1952 to 1956, he was Secretary of the Class of Mathematics and Science of this Academy. From 1948 to 1950, he was president of the Austrian Mathematical Society. Johann Radon married Maria Rigele, a secondary school teacher, in 1916. They had three sons who died young or very young. Their daughter Brigitte, born in 1924, obtained a Ph.D. in mathematics at the University of Innsbruck and married the Austrian mathematician Erich Bukovics in 1950. Brigitte lives in Vienna. Radon, as Curt C. Christian described him in 1987 at the occasion of the unveiling of his brass bust at the University of Vienna, was a friendly, good-natured man, highly esteemed by students and colleagues alike, a noble personality. He did make the impression of a quiet scholar, but he was also sociable and willing to celebrate. He loved music, and he played music with friends at home, being an excellent violinist himself. His love for classical literature lasted through all his life. In 2003, the Austrian Academy of Sciences founded an Institute for Computational and Applied Mathematics and named it after Johann Radon (see External link below). * He is possibly the first to make use of the so called Radon-Riesz property. * O'Connor, John J.; Robertson, Edmund F., "Johann Radon", MacTutor History of Mathematics archive, University of St Andrews, http://www-history.mcs.st-andrews.ac.uk/Biographies/Radon.html .